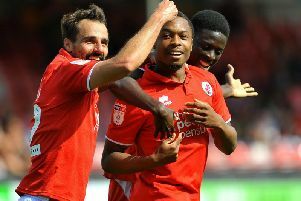 Selfies have been banned at Crawley Town’s Checkatrade.com Stadium selfie spot - but it seems the ban will not be strictly enforced. The club launched a pitchside ‘selfie spot’ earlier this month, inviting supporters to snap a photograph of themselves with the football pitch in the background. However, Reds seemed to have now adopted an anti-selfie stance following light-hearted criticism in national media. Club official Bruce Talbot admitted that, despite the ban, the club would ‘turn a blind eye’ to those breaking the rule. He said: “Anyone can take a selfie anywhere they like in the ground – and even if they take a selfie in front of the ‘Don’t take a selfie’ sign, we’d turn a blind eye. In the last week, the sign has been adapted with another plaque placed on top, after a national newspaper reported on the original ‘selfie spot’. It now instructs the club’s supporters that ‘strictly no selfies (are) to be taken from this spot under any circumstances’. The sign also warns potential photographers that ‘failure to comply could result in eviction from the stadium’. To emphasise the ruling, an image of a person taking a selfie on a mobile phone with a line through it is included. This represents a stark change in policy from the previous sign, which encouraged fans to stand by a brick wall and snap their selfie.